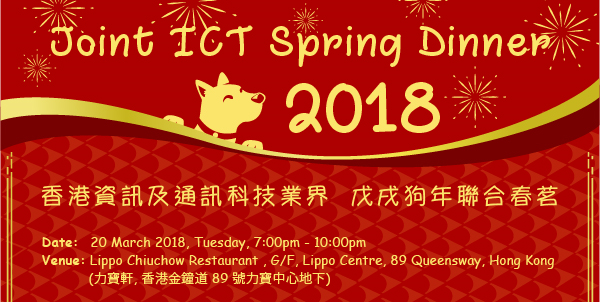 To greet and celebrate the year of dog, the Hong Kong Information Technology Federation (HKITF) and Hong Kong Wireless Technology Industry Association (WTIA) are jointly organizing the Joint ICT Spring Dinner, will be held on 20 March 2018 (Tuesday). Please click here for details and registration. We look forward to your presence at this event! April 12 - 13 (Thursday - Friday) - Special Discount for WTIA Members! WTIA members enjoy a discounted price of $1,000 (Promote code: wtia1000) to join the summit, please click here for more registration. April 13-16 (Friday - Monday) - Booth Rental Special Offer for WTIA Members! May 15 (Tuesday) - Ticket Special Offer for WTIA Members! WTIA members enjoy the special deal on ticket purchase by using promote code: WTIA-mem. Please click here for registration.